Catkins wrote: So Kelvin 'Gor Blimey, Man of the People' Mackenzie went to a Dulwich public school which currently charges £18k per year. That's where Farage went when he was so proud of his initials. AOB wrote: That comment he made about S*n readers being 100-1 in his favour, if true, means nothing. If you are suspended from work, or sacked through a fault of your own,, the only messages you are likely to get will be people sympathizing. For example, you might get half a dozen well-wishing texts or messages from family or friends, people hoping you find work soon or are re-instated. You could then twist logic to say 100% of people are in your favour and back you. Not only is it twisting what the well-wishers mean (they might think your employer was correct to suspend/sack you- best wishes for the future is a separate matter entirely) it also doesn't take into account all the people aware of the facts and think you full deserved to be sacked/suspended, but choose to keep their views to themselves. Or 99% of Sun readers are racist cunts. I did think this. S*n readers are hardly a useful barometer. I got the impression, he meant the 100-1 thing was about the Liverpool comment. The discussion did get blurred somewhat with the Barkley comment and also the comment about the only rich people in Liverpool being drug dealers or footballers. Most wealthy people from, and who work in Liverpool, live in the suburbs, as they do for several major cities. Formby and Southport have many wealthy residents, as do parts of the Wirral such as Heswall. They commute. A lot of young professionals live in the ever expanding Docklands area though, in the luxury apartments there. Mackenzie obviously knows best though seeing as he must be a regular visitor to the city! He's only been suspended, probably on full pay. Murdoch will shuffle him into the shadows for a while then bring Kelvin back when the fuss has subsided. See Rebekah Brooks. Daley Mayle wrote: He's only been suspended, probably on full pay. Murdoch will shuffle him into the shadows for a while then bring Kelvin back when the fuss has subsided. See Rebekah Brooks. Nobody ever stops working for Murdoch. At the time it applied to executives who were "downshifting" to work at regional titles. It was occasionally used, with a veiled nod, about various public servants who'd accepted inducements. No one else is running with that at the moment. Yes, that appears to be Tim's source. Former Sun editor Kelvin Mackenzie is to leave the paper after making controversial comments in a column about Everton footballer Ross Barkley. Mr Mackenzie was suspended after comparing the player - who has a Nigerian grandfather - to a gorilla. The BBC's media editor Amol Rajan said: "Now we know he will not be asked to contribute to the paper again". 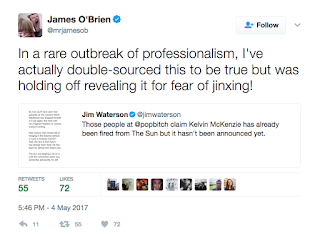 A spokesman for The Sun said Mr Mackenzie "remained suspended" but would not comment on his departure.